If you are like me you have over 2000 of everything from TAC Gear Challenges, over 2000 of everything except Mk6 Chiewab Hypo Syringe Salvage in AGI Gear Challenges but you can use 3 pieces from STR Gear Challenges. It's so incredibly not balanced for what the characters in the game require. I love the fact they can be completed instantly now but I would sacrifice that for something I can actually use, I mean the few credits i get from them are more useful than the gear now. I actually Think challenges are in a good place. You get something for literally no effort other than logging in - although they are called challenges, that’s not a very fitting description.. They were a challenge and I remember relying on them to close out gear sets. They are early game content, they serve little purpose now but that's ok.
Maybe add another tier with more of the stuff we need, but they are not meant to be difficult or provide a great source of any particular thing. How about Challenege Double Drops every Sunday. This would make things a bit looser without compromising any integrity. Sunday already has all the challenges. The ability mat challenge is still very useful especially for lower level people and people who just hit 85. I agree with creating a new tier with new gear or something because it is kind if getting boring. I think that the new tier will come with level 90. I don't even bother with TAC now. That one is the only one that needs attention. However I always need carbantis and mk VI hyposyringes. So the other two get hammered. Oh and given the constant influx of new toons, mk IV laptops are also always needed along with the droid callers. The bounty challenge could maybe get a small buff. It's reasonable amount of credits for the work (3 sim tickets). I wish I could do 5 ability challenges. Training droids......no idea on those as I have thousands of the lower ones anyway. I agree completely. TAC is a waste even for a relative newcomer like me. 800-3000 of everything, and the 800 credits and 20 ally points are fairly much an insult (especially since ally points are a pain mashing buttons ceaselessly to get packs). An additional level to address the evolving needs may be a good thing. I’m not so naive not to realize these aren’t revenue generating items, but they are almost an insult to seasoned players. So, I’d lump this into the quality of life and player retention category. Why have content that makes the whole community roll their eyes? It’s not a good thing, even if it doesn’t have a direct connection to revenue. It does definitely have an indirect connection. That said, I do think the Devs here deserve credit for being much better than several other games that I’ve played, and thanks goes out to the customer service team as well. All games have this issue of old/worthless/outdated content, and I’m hopeful this team will step up and clean up the mess. If they'd throw in an extra 400 Carbanti per STR challenge I'd be a happy man. And speaking of dated content, what the heck is the 12 Days of Spring achievement? I also see that I get very little use out of the gear that is provided and I thought that was due to my choice in character progression. However, from what I'm reading on the comments here, it's something that happens to everyone eventually. This is clearly a design problem to me if everyone ends up in the same boat with challenge gear meaning very little to character progression yet being required to complete two for the daily quests. I don't spend much on shards a few here and there a month as doing more just seems like pay to win and a waste of money. I enjoy the challenge of building characters from the free accessible content and Challenges is one of them. 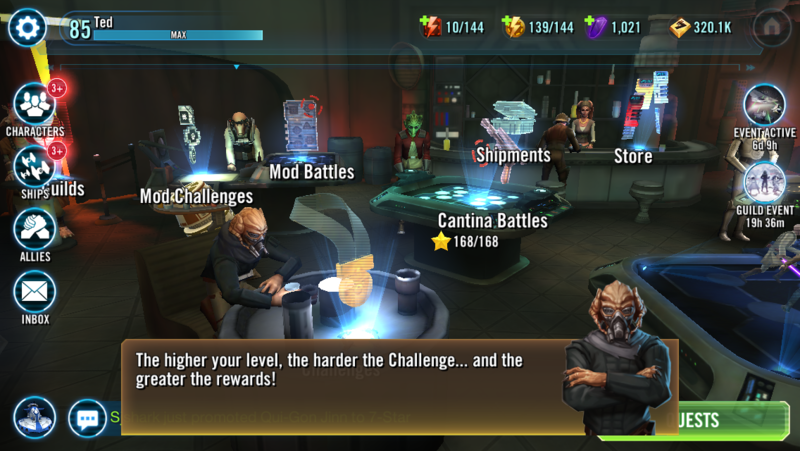 I also find it odd they are called "Challenges" but once three-starred they are anything but a challenge. 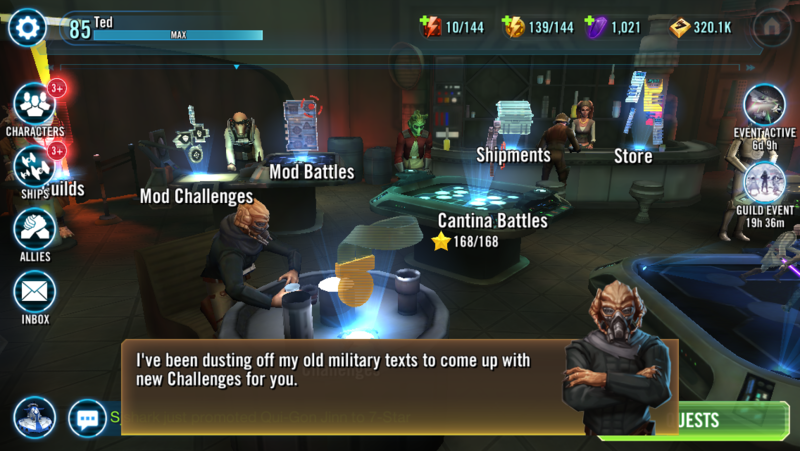 To me, a challenge system sounds more like active battle content, where I wouldn't be able to sim it, more like the event system. I think I would enjoy it much more if it was a randomized scaling battle that gives me a challenge and provides all the rewards at once after completion, instead of 5x or 3x repeated instant wins with 2m cooldowns. Or even better, have challenges and rewards both scale to the gear level of the selected team to make them an actual challenge and encourage diversity on challenges to help gear specific characters the player is trying to gear. Anyways those are my thoughts on the topic, love the open discussion on here about various things. The community here is pretty great. A Veteran RPG Gamer who never stops looking for ways to improve his gaming experience and well as those of others. Rants, Ravings, Tips, Tricks & Brainstorms of a Veteran RPG Gamer.